Markets for certified sustainable agricultural products are outpacing conventional markets and are expected to continue to grow globally in the coming years. This expansion offers opportunities for small-scale farmers in developed and developing countries to produce food sustainably and cost-effectively. Yet sustainable production is mainly concentrated in developed countries. Our challenge is to open up the same opportunities to smallholder farmers in developing countries. At IFAD, we see enormous promise in certified sustainable agricultural products. To label these products as sustainable, an independent certification programme must make inspections and determine that growers use environmentally and ethically sound farming practices. 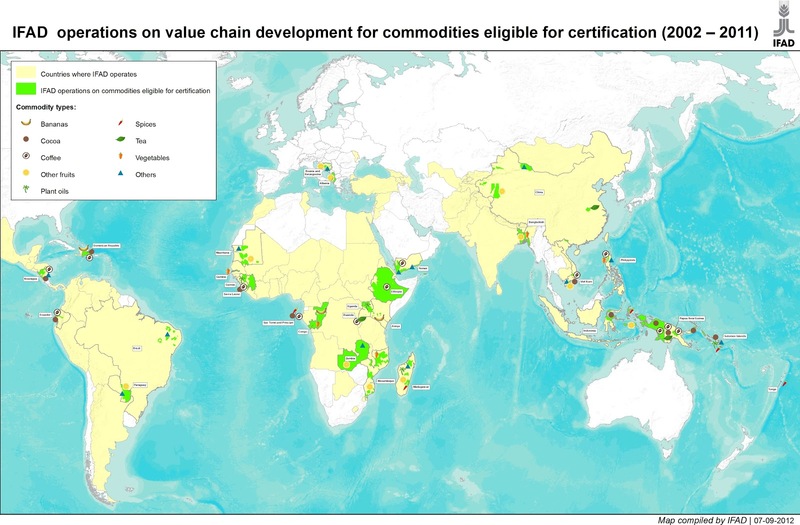 Over the last 10 years, IFAD has funded 43 programmes focusing on value chain development for commodities that are eligible for voluntary certification. The programmes cover a wide range of crops in different parts of the world. As the map below indicates, there is significant potential for growth. While such programmes can help smallholder farmers, they also raise questions and challenges. For example, how will smallholders learn how to produce sustainably? What does sustainability imply for them? How will they obtain certification for their products? And once certified, will their products be marketable? Answering these questions requires active learning on the part of smallholder farmers and strong linkages with markets, which public-private partnerships can provide. To foster such partnerships and strengthen smallholders’ access to markets for certified sustainable products, the IFAD Technical Division and the West and Central Africa Division have launched a programme called Strengthening Smallholders' Access to Markets for Certified Sustainable Products, or SAMCERT. 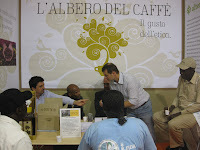 Ø Developing relationships with key market actors to support certification-based partnerships along the supply chain. So far, SAMCERT has focused on IFAD projects in West and Central African nations, including Sierra Leone, Liberia, Guinea Conakry, and São Tomé and Principe. It will soon expand to one more country in West Africa, one in Latin America and another in the Asia and the Pacific region. In São Tomé and Principe, SAMCERT supports the Participatory Smallholder Agriculture and Artisanal Fisheries Development Programme (PAPAFPA), an ongoing IFAD project. Its objective is to improve poor rural farmers’ and fishers’ access to national and external markets. Smallholder families participating in the programme have seen their yearly income increase, on average, from 25 per cent below the poverty level to 8 per cent above it. 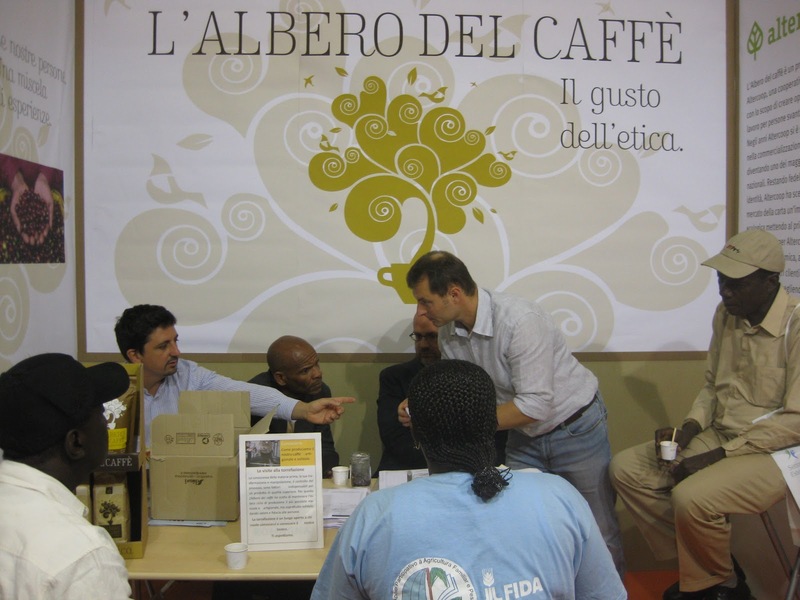 PAPFPA’s success is linked to the development of strong ties with key partners, such as Kaoka and Cafédirect for organic and Fairtrade cocoa, Malongo for organic coffee, and Hom & Ter for organic white pepper. The project shows that smallholder farmers can produce high-quality products in a sustainable manner – and that market barriers can be overcome. In Sierra Leone, SAMCERT is engaging with the Rehabilitation and Community-based Poverty Reduction Project (RCPRP), which supports efforts to certify cocoa as Fairtrade and organic for export. Following up on a February 2012 scoping mission, SAMCERT facilitated a September training session on preparing for Fairtrade inspection in the country. Three Sierra Leonean cooperatives will be certified Fairtrade before the end of 2012. They will also receive support from SAMCERT on internal control systems (ICS), a key element for voluntary certification. An ICS training session is planned for early 2013. Representatives of the projects in São Tomé and Principe and Sierra Leone participated in the 24th exhibition of organic and natural products, SANA 2012, which took place 8-11 September in Bologna, Italy. 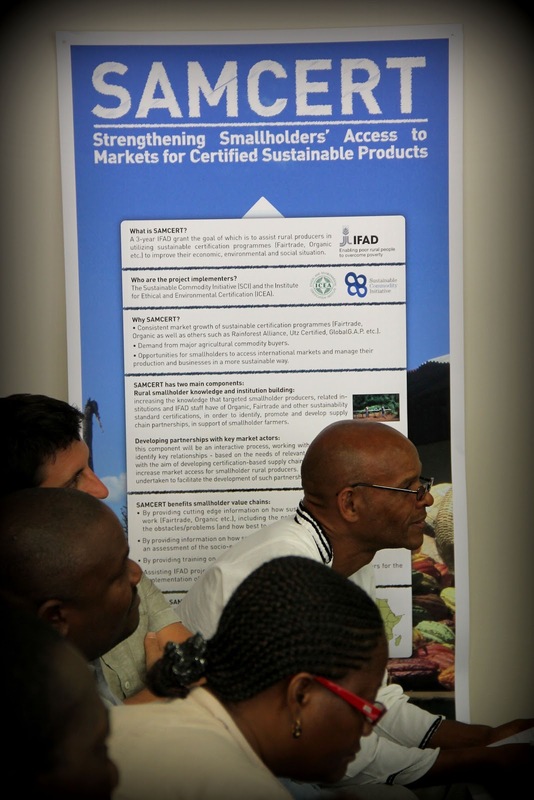 There, they shared experiences involving access to markets for certified commodities, and discussed the benefits of certification for smallholders. The project participants also met with suppliers, distributors and buyers, some of whom were interested enough to request samples of their products in order to carry out quality tests. These tests represent a first step in the marketing of certified sustainable products. SAMCERT is keen to have producers attend events such as SANA, in hopes of opening up concrete opportunities for smallholder farmers and paving the way for new public-private partnerships. IFAD can play a strategic role in supporting such partnerships. For its part, SAMCERT is bringing together the key actors involved in the sustainability certification process: producers, the private sector, standards bodies and consumers. 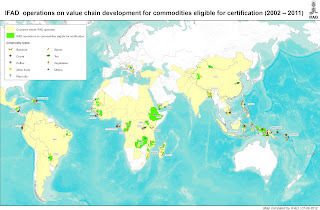 While certification is not an end in itself – and is not the solution for all poor smallholder farmers – it can be a viable option to improve and diversify market access, and develop longer-term commercial relationships. On 12 September, right after SANA 2012, a SAMCERT seminar was held at IFAD. Participants analysed the role of suppliers and other value chain actors, and talked about how to build effective and sustainable partnerships. 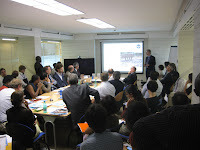 The seminar was extremely well attended by representatives of IFAD, ICEA and SCI, as well as Cafédirect and many other private-sector partners. The seminar is over but the discussion continues, and SAMCERT welcomes your input. · Public-private partnerships, or PPPs, usually involve a larger number of stakeholders than traditional commercial arrangements. With more participants comes more complexity. How can this complexity be minimized? · PPP stakeholders have different backgrounds and different ways of communicating. How can they best overcome communication barriers? · PPP stakeholders often have different project timeframes. How can they find the right balance in order to move forward together? · PPP stakeholders may have different perceptions of risk. How can they develop a common approach to risk management? Your comments are greatly appreciated. Where there’s a will, there’s a way – to build strong partnerships together!